A breech birth refers the way a baby is positioned to descend the birth canal. Normally, a baby is born headfirst. In a breech position, which happens in about three percent of births, the feet or buttocks will come first. What Are the Risks Associated with a Breech Birth? Most breech babies are born healthy. However, when an unborn child is in a breech position, delivery can be more complicated and health concerns can be elevated. Breech babies are at a higher risk for cerebral palsy, for example. 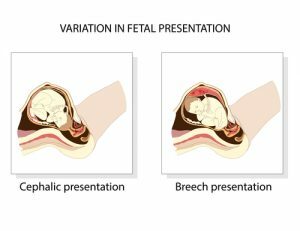 What Options are Available if a Baby is in Breech Position? Your doctor will offer a variety of solutions to either turn the baby or deliver the breech infant in as safe a manner as possible. The first option, an external cephalic version (ECV), involves the obstetrician applying pressure to the mother’s abdomen in attempt to turn the baby into a headfirst position. Although it can cause discomfort, the procedure is safe and is successful 50 percent of the time. If ECV does not work, the midwife or obstetrician will discuss other options with the mother. Oftentimes, the delivery is performed via C-section, but there are certain situations for which this method may not be recommended. Bottom line: A breech birth present risks that aren’t present in normal deliveries. In order to prevent potential birth injuries, it’s critical that the professionals assisting with the delivery do their jobs appropriately. If your baby has suffered a birth injury due to a breech birth, you may be entitled to monetary compensation. Thurswell Law has been representing families in birth injury cases for over 47 years. Contact us today at 248-354-2222 for a free consultation.